The company hopes the well-known consumer brand will make its program more accessible. 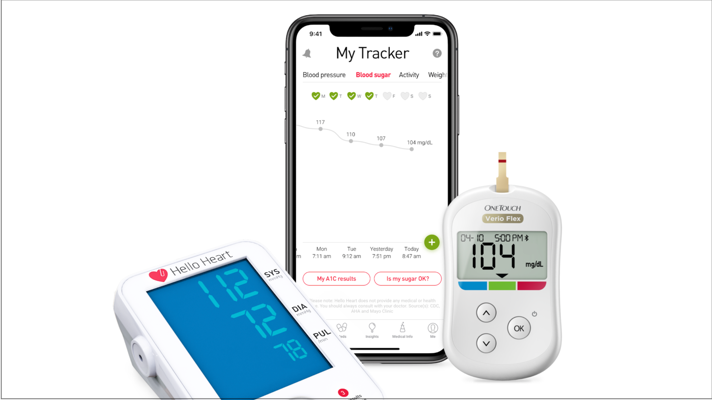 Chronic disease management platform Hello Heart will now integrate with LifeScan OneTouch meters as part of its program for diabetes management. The Redwood City, California-based company started out in hypertension, but has been expanding into diabetes for the past year. OneTouch meters, formerly owned by Johnson & Johnson, are the first of a handful of glucometer brands the company intends to support. Hello Heart is a chronic disease management platform that focuses on two main differentiators from competitors, CEO Maayan Cohen told MobiHealthNews: it is purely digital, eschewing human coaches, and it guarantees patient privacy — data is shared with physicians only at the patient’s request, and only aggregated, deidentified data is shared with employer clients. “I think that’s one of the key factors to getting to all people with chronic conditions, and not only the ones who really want to be active and are very open about their health, but the ones that are actually in denial about it or have a lot of fear and shame around their condition, which is a very big component of chronic disease,” Cohen said. LifeScan meters have significant market penetration, so a number of patients already use them. Additionally, the OneTouch meter is considerably smaller than the branded glucometers from competitors like Livongo. Hello Heart will also send replacement test strips directly to the user’s doorstep, using an algorithm to predict when they will run out. If that fails, the ubiquity of the device is another strength. Hello Heart counts itself in a growing and competitive field of companies like Omada Health and Livongo (which recently published early data about its hypertension product) that are focused on using digital tools to help people manage and prevent chronic disease. Lately, companies in this space have been expanding at clients’ behest to cover more disease states, chief among them hypertension and diabetes. Hello Heart’s move into the latter will help it to compete with its peers.